Nobody ever said picking tops was easy (or if they did, they need a stern talking-to). Yesterday, I discussed the fact that the Nasdaq 100 (NDX) had previously gapped directly into my target zone, and that the bears needed to hold the line there. They did, and the market reversed. But bears aren't out of the woods yet (on second thought, do bears really want to be out of the woods? The woods are a bear's natural habitat, and probably where he feels safest. Maybe I should say, "But bears aren't into the woods yet"?) As a quick reminder, the bears need to keep the NDX below 2438.45. Even though the market reversed, over the short-term the market has yet to tip its hand. 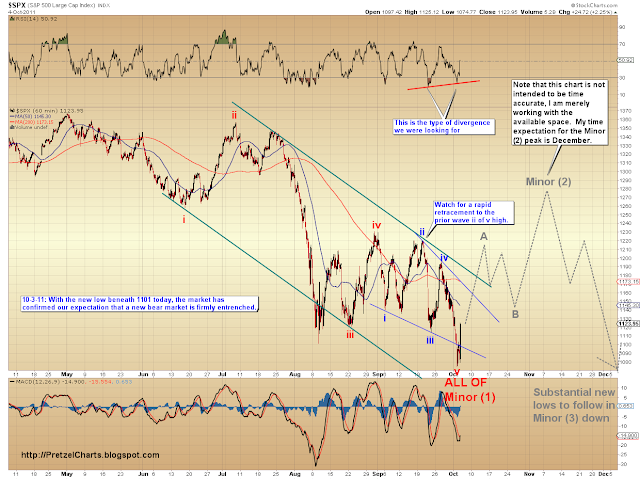 The assumption is that we are in Wave B-down (see updated 60 minute chart), but there's no confirmation yet. The one-minute charts simply haven't yet completed enough wave structure to be able to anticipate the market's short-term intentions with pinpoint accuracy. If this is, in fact, Wave B, the preliminary target zone for the NDX is 2170-2250. For the S&P 500 (SPX), the preliminary target range is 1130-1167. Since the market hasn't given me much short term structure to work with, I'm going to focus more on the big picture for the SPX. At the end of the article, I'll also present another possibility for a top formation, in the event that Wave B hasn't yet started. This chart has tracked ridiculously well -- even down to the dates, which I honestly wasn't anticipating. Clearly, after drawing this chart, I should have just entered my sell orders and gone fishing for a couple weeks. The count shown above remains the preferred count for the moment. Under this view, the market has completed, or will soon complete, the first leg (Wave A-up) of a three-leg countertrend rally. 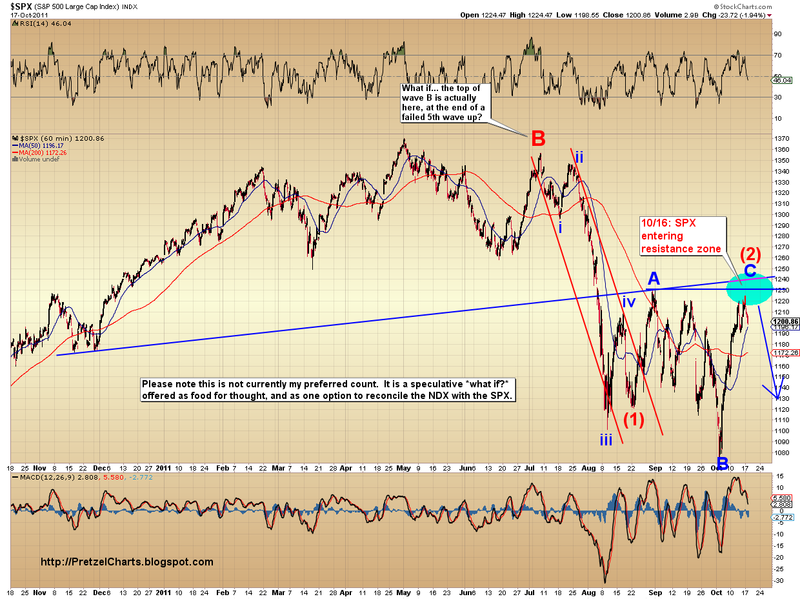 The SPX should have a correction coming soon, which will likely retrace 50-62% of Wave A. The rally has been so fast and steep, that I would expect a fairly deep retracement before we get any significant launch higher. After the retracement, we should then make a new high -- a test of the prior head and shoulders neckline looks likely -- to complete the rally, which I am labeling as Minor Wave (2). 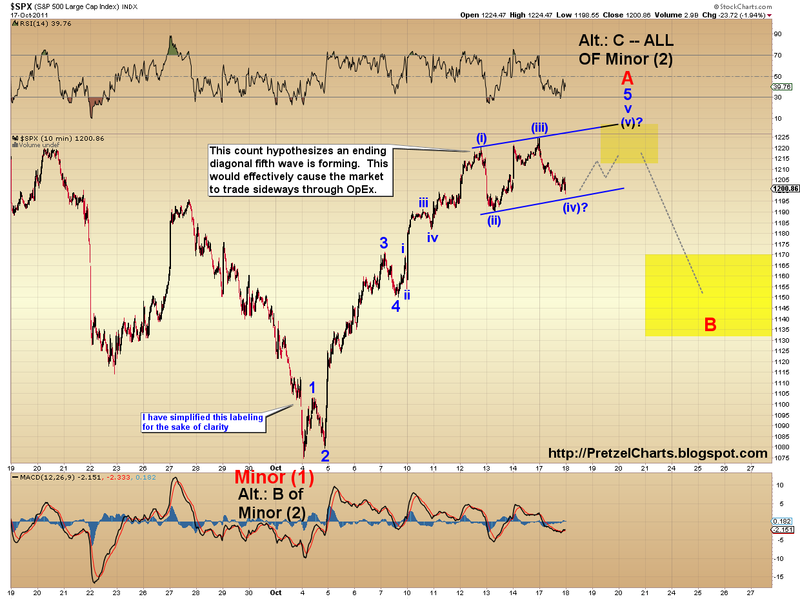 Once the rally is over, the market should then begin working on Minor Wave (3) down. Minor Wave (3) will, at some point, almost certainly take the form of a waterfall decline to substantial new lows. Under Elliott Wave Theory, third waves are usually the longest, and never the shortest waves. Third waves often travel a minimum of 1.618 times the length of the first wave. In this case, the first wave from the May high of 1370 to the October low of 1074 was 296 points; so we can anticipate the odds are good that the third wave will travel 479 points or more. Third waves can sometimes even extend by as much as 4 to 6 times the length of the first wave. For a recent example of this, look at the 60 minute chart of the SPX, where the market produced a dramatic extension of the red Minute Wave iii vs. the length of red Wave i. The alternate count shown above came into being as a result of the strength and breadth of this rally. Under Elliott Wave Theory, different waves exhibit different characteristics. Certain waves, such as A-waves, are usually somewhat faltering and unsure of themselves; they generally back-and-fill a lot, and meander their way to their destination. Other waves, such as C-waves, are strong and determined; they are rapid, powerful moves that convince the masses the prior trend has changed. If this rally off the 1074 low is actually an A-wave, as shown in the preferred count, it is an unusually powerful one. If this is Wave C of Minor (2), the patterns should alert us to that fact before the actual crash starts. In conclusion, the big picture is still bearish, and I am expecting the short-term picture to clarify further over the next few sessions. Well done. Very clearly written. I like how you describe some of the details of EWT, such as the typical behavior of each wave form. Do you feel that seasonality plays a role in Elliot Waves? Your preferred count would have us headed to the Minor (2) top during seasonally bullish December. 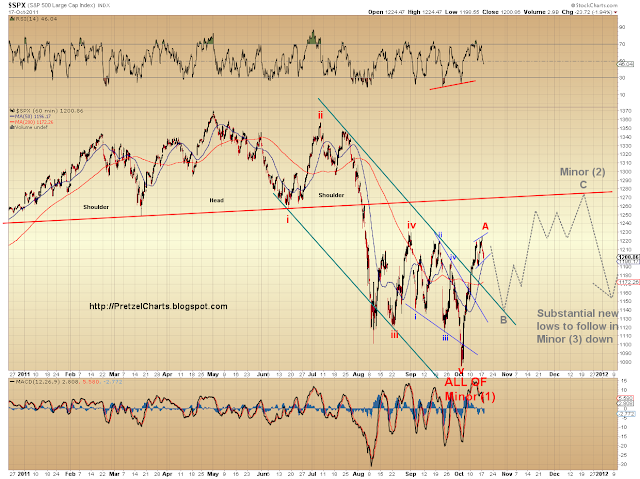 Seasonality certainly seems to play a role in the market, so it seems to track its way into the wave forms. EWT doesn't really factor in seasonality in any sense, but it's one of the many little things I personally use to help my analysis when I have 2 or more counts which seem viable. Santa Clauss has not been good every year....!!!! Thanks for yet another riveting read! Incidentally, with the S&P just hitting 1212, at what point should I start to get worried about being 100% short? Pretzel -- well done. I am sure you will address this in your post on todays market - but did the move to 1233 take out the ending diagnol alternative and leave us any closer to Alt 1? 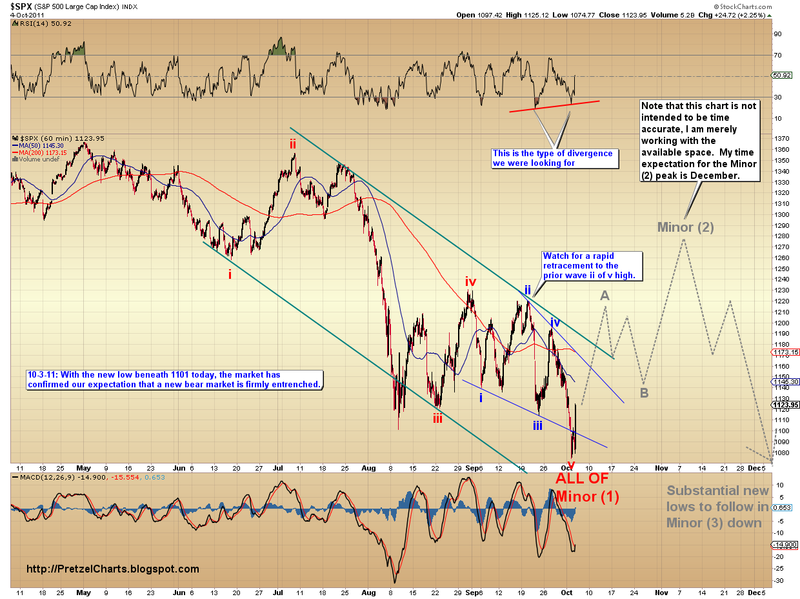 Either count suggests next move is lower and AAPL's move should get NDX more in line with SPX. POTUS- The move to 1233 is/was still within the zone where an ending diagonal would be expected to end, as I had highlighted in the yellow target box on the chart. I updated the chart in the new article. I just updated the new article with a bullish alternate count. It is possible that the recent correction was actually wave 4 and we are now in the fifth and final wave up; meaning wave B hasn't even started yet (!). 1260 would be the cap under this count.